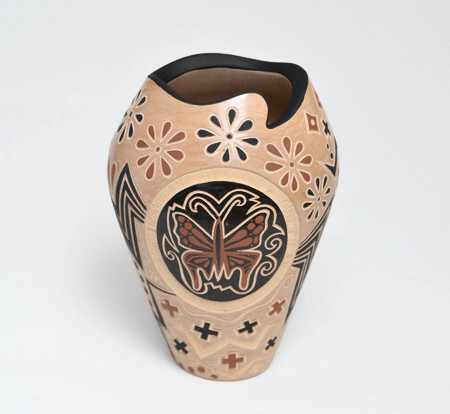 Dragonfly & Flowers Pot by Glendora Fragua (Jemez) Glendora Fragua Daubs was born in 1958 and is a member of the Corn Clan. 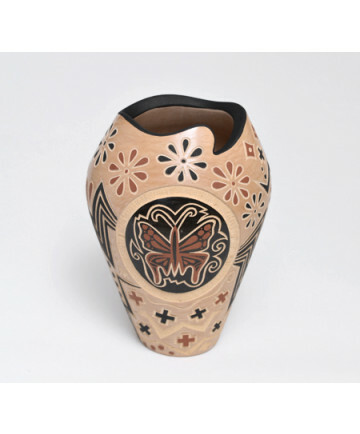 Her mother is potter Juanita Fragua and she has been active making pottery since 1976. Glendora is known for her fine sgraffito red and tan ware. Her work has been published in American Indian Art Magazine, Cowboys and Indians and it is in the permanent collection of the Philbrook Museum of Art in Tulsa, Oklahoma. She sometimes collaborates with her husband Dennis. Glendora signs her work with an incised cornstalk. This pot measures 5 1/2 inches tall by 12 1/4 inches in circumference. Approximate diameter measures 4 inches.